A research team led by Rui Carvahlo from Queen Mary University in London has published a model that shows how to handle congestion in Europe’s gas supply network in case of crises and supply disruptions. The model is meant to offer a “resilient response strategy to energy shortages”. The researchers conclude that “in essence, Europe’s gas supply can be made robust even to major supply disruptions, if a fair distribution strategy is applied”. What they did was to build a model of the supply network, then to simulate crises by removing gas from major exporting countries such as Russia and Norway to see how this would affect the distribution of gas. The most significant effect was congestion in certain pipelines as a result of the sudden redistribution of supplies. Carvahlo and his team offer three possible solutions to this problem: build more pipelines, increase the price of gas flowing through bottlenecks, or achieve better pan-European cooperation. They recommend a combination of the second and third solution as the best option. 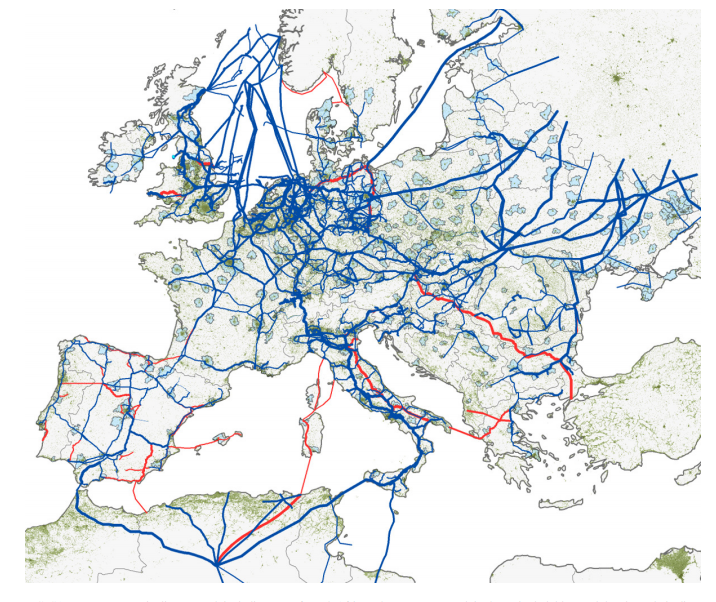 Europe’s gas pipeline network (source: http://arxiv.org/pdf/1311.7348v1.pdf). Planned pipelines in red.